Free Energy -- the secret they can't kill. The man in the photo [right] is Bob Boyce. You probably have never heard of Bob until now. Some people obviously hoped you never would. Bob has just been diagnosed with a terminal cancer and it is likely that he will die before his breakthrough discovery is widely known. But we hope to change that with this story. Bob Boyce has done the impossible. He has developed an apparatus that is capable of recharging a heavy duty battery with energy that comes from the environment. I use the term from the environment because, according to the laws of physics, we cannot create energy from nothing. But that might be a better description of what appears to be happening. We're talking about Free Energy. Bob is a very likable guy. He is a little heavy, has a beard and is missing his front teeth. But his smile immediately warms your heart as he enthusiastically talks about his work. From the get-go you sense that this is a man who has a thorough understanding of some very complicated theories. He doesn't use big words like some scientists. Instead he is able to explain exactly what he has done in a way that even a novice can understand. Well... maybe. I'm not sure I could replicate his work. I even hesitate to write about it. But others have successfully done just that and have built their own "free energy" machines based on Bob's theories and techniques. That's why some people think he's dangerous. This all began years ago when Bob was a race boat enthusiast. He took his small boats to many "heats" as they are called, and was looking for a fuel with more energy to give him an edge over the competition. His first thought was hydrogen. Hydrogen has been used in autos and boats before as a fuel but it has some downsides. It's a highly explosive gas (remember the Hindenburg?) and must be stored in heavy metal bottles. It's also expensive to buy and often unavailable when you need it. The ideal solution for Bob was to manufacture hydrogen himself using a process called electrolysis. The technology of hydrogen production through conventional water electrolysis is well-established. Conventional electrolysis splits water into its components -- hydrogen and oxygen -- by charging water with a DC electrical current. The charge breaks the chemical bond between the hydrogen and oxygen and splits apart the atomic components. The resulting ions form at two poles: the anode, which is positively charged, and the cathode, which is negatively charged. Hydrogen ions gather at the cathode and react with it to form hydrogen gas, which is then collected. Oxygen goes through a similar process at the anode. The main drawback of conventional electrolysis for large-scale hydrogen production is the amount of electricity required for the process. Bob's discovery changed that. It involves superimposing an alternating high-frequency current (AC) on the DC current that supplies the anode and cathode. He also uses multiple plates and cells to dissipate heat. 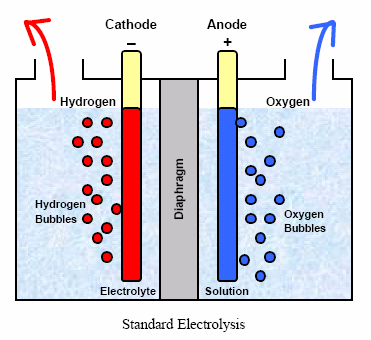 The release of hydrogen gas is multiples of what can be recovered in a standard cell like the one pictured above. According to Bob, there are two things needed to create this effect. The first is an abundance of electrons. Bob uses a solution of sodium-hydroxide. 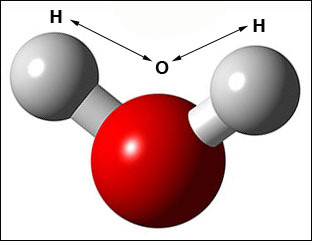 The second is the resonating energy to do the work of splitting the H2O into hydrogen ions and oxygen. Bob explains that the "mouse ears" (his phrase) of hydrogen bonds that extend off from the oxygen atom get stretched and twisted by the resonating current. This is just enough to make the bond break, after which the hydroden ions need to quickly pair with an electron to form hydrogen gas, or else they will just reform back in to H2O. The frequency of the resonating current is critical. But when you have everything just right it's almost a miracle -- the miracle that big oil and coal companies hope you will never see. It was during one of Bob's "heats" (races) with his hydrogen powered boat that he noticed an anomaly. When the boat reached a certain speed it would suddenly power up like it was super-charged. Curious, Bob took his engine apart and found that one of the rectifiers had malfunctioned, allowing some alternating current (AC) to mix with the direct current (DC) that was being fed back into the hydrogen cells. This mistake apparently caused the battery to produce many times the normal hydrogen output and, for some reason, the hydrogen gas itself seemed to have more energy. Bob next made a scaled down version of his hydrogen cell inside a plexiglass tank so he could see what was happening between the electrodes. 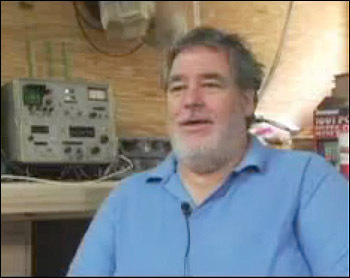 He also brought in some oscilloscopes and frequency generators to monitor and record the odd behavior. He noticed that when the DC was applied to the hydrogen cell it produced the expected volume of hydrogen gas. But when he superimposed the high frequency AC at a particular frequency the hydrogen production was greatly accelerated. He repeated this many times with the same results. It was about this time that someone broke into his laboratory, set up in the back of his small electronics business. Oddly, they damaged only the apparatus used in his hydrogen experiments. Bob wasn't discouraged. He set up new equipment and continued his research. But just a few days later his lab was vandalized again. Despite having lots of other expensive electronic equipment, only his experimental hydrogen equipment was be damaged. Someone didn't want him to continue. Bob went on to power an automobile with his resonating hydrogen battery and soon found that he could use the output of the battery to recharge itself! The hydrogen cell, modulated by the AC, was able to produce excess energy that appeared to defy logic. 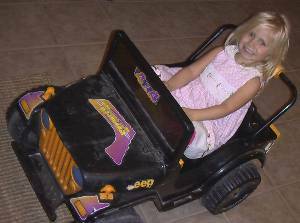 On Nov. 12, Pure Energy Systems News reported that a South African experimenter had modified the electrolysis circuit developed by Boyce so that now it recharges his daughter's electric riding toy. What makes this remarkable is that the energy is not drawn from the wall or even from a hydrogen cell. The battery uses Boyce's resonating circuitry to power a large transformer which returns the power, plus additional "free" energy, to the battery. In effect, the battery recharges itself overnight. The experimenter has done this around 35 times now and knows of three replications of the effect by others. Pure Energy Systems News created a feature page and a discussion list and has facilitated additional replications and development of the technology. There are also many "how to" videos on YouTube. Pure Energy Systems News also reported in the same story that Bob Boyce has "terminal" cancer, and that his days are numbered if some kind of remedy isn't found. But wait... there's more to this story. When doctors were removing the tumor on his shoulder they noticed something. It was very small -- about the size of a grain of rice. It looked electrical. What could it be? It was discovered to be a small tracking microchip, manufactured by a company called VeriChip. It was at the center of Bob's cancer and appears to have been the cause of his illness, and perhaps his untimely demise. Bob was unaware that it was there. He has never allowed any implants to be placed inside his body and has no idea how it could have gotten there or who would want to do this to him. The microchip is usually inserted just under the skin and contains only a unique, 16-digit identifier. The microchip itself does not contain any other data other than this unique electronic ID, nor does it contain any Global Positioning System (GPS) tracking capabilities. The chips work in much the same way as theft-protection tags that are placed on expensive items in a retail store. They contain no power source themselves but, when in the proximity of an electromagntic field, they power-up and emit a few bursts of RF (radio frequency) energy with the ID encoded. Since Bob worked around powerful electromagnetic sources all day the chip was likely always on -- like a microwave transmitter inside his body. CASPIAN's new report ... is a definitive review of research showing a causal link between implanted radio-frequency (RFID) microchip transponders and cancer in laboratory rodents and dogs. It was written in part to correct industry misstatements and misinformation circulating about the studies. The report evaluates eleven articles previously published in toxicology and pathology journals. In six of the articles, between 0.8% and 10.2% of laboratory mice and rats developed malignant tumors around or adjacent to the microchips. Two additional articles reported microchip-related cancer in dogs. Obviously this implant saw lots of air-time as Bob's worked in his laboratory. Whoever placed this chip in Bob undoubtedly knew what they were doing and wanted to silence his work. First, let's pray that Bob recovers. Not just because of his discovery, but because he is a genuinely good person who has been the target of evil. Next, let's get Bob's discovery out in the open so it cannot be suppressed. This work holds the promise of scalar energy and so much more. It is not surprising that other interests would be afraid of this new technology. Tell us -- what do you think? Please tell me where to find his drawings or any way to make this system work. All I have is words and cannot build the machine from words need drawings. Its such a shame that the world is so greedy and evil, that when we have major break throughs or discoveries that can help and serve man kind freely, they are quickly shutdown, disappear, are murdered or get an illness that ends their lives. This is a brillant energy source and has been visited many times by different people in the last 100 years, but the people all ended in dire consequences and no further follow up was done. The greedy evil bastards at the top have a lot to answer for, and unfortunately they will be responsible for the demise of man kind. There has got to be something done, because as free living people of this planet we have a right to life and the way in which we live and how we live it. We are not so called test lab rats, at there discretion of what we can and can not do, to feed their want of control and gain. This really does show that we live in the end times, the dire times when man is so blinded by his own wonderfulness and disrespect for the world and man kind alike. If we stand up we are pursued, if we invent we are shamed or killed off, if we submit we will die any way with all the rotten controls and diseases. This is truely and evil world and time we live in. I pray for a speedy recovery for Bob. Let's hope the diagnosis is wrong. I just wanted to comment that I read about a man in Florida that was able to ignite water on fire, using a wick, as if the water were oil. He used a frequency generator also and said that the vibrations caused the water molecule to break apart almost instantly, releasing the hydrogen gas, which burned and then returned to water again. The whole thing is on youtube somewhere. The problem these days is that as soon as some new invention or idea is known it is quickly made secret and used by the military as some kind of weapon. We saw this with the HAARP and now this. Maybe the internet and web sites like this can somehow break this cycle. Thanks Bob. I hope you get better.